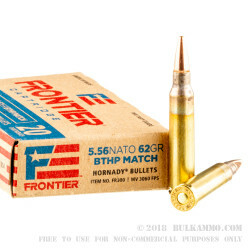 Your brand new tack-driving SPR build will shoot its tightest groups with match-grade ammunition that's been tirelessly toiled over; that level of quality is exactly what you'll get with these 5.56mm rounds from Hornady's Frontier line. 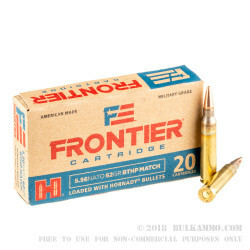 The Frontier brand is specifically manufactured for use in AR-15s or MSRs, and utilizes Hornady's own bullets along with components from Lake City, the manufacturer responsible for most US military loads. 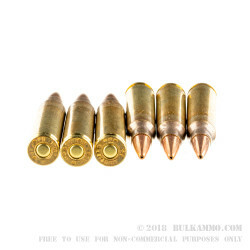 Components include hard Boxer primers that are safe for use with free-floating firing pins and contain zero corrosive elements that could be harmful to your rifle's parts. Each primer is installed at the base of a brand new brass casing that has been properly annealed (heat-treated) at the case shoulder for flexible strength that will survive a few reloading cycles. The case contains a precise measure of ball powder which makes proficient use of the available space in order to generate ample energy for long-range shooting. This focus on precision is complimented by Hornady's own BTHP (boat-tail hollow point) projectile which is constructed with a lead core of consistent density, a uniform gilding metal jacket, and a tapered rear which all help resist drag and crosswinds for accuracy at a distance. A bullet weight of 62 grains gives this load stable compatibility with the most common barrel twist rates and lengths as well as a well-known drop characteristic that is familiar to anyone who has fired the ubiquitous M855 "Green Tip" load. Q: When do you expect hornady/lake city to offer this again. A: Hi Reg. We do have this (and all other Hornady match ammo) on order. Unfortunately, we do not get a shipping schedule. Please keep an eye on our website and when it does come in, you will find it listed for sale there. I am sorry we are out of stock.